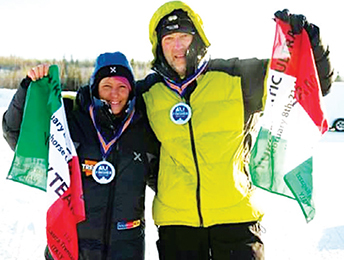 Last February the Volley Team took only 48 hours to cover the Yukon Artic Ultra 2015, the off-road race within the snow-covered forests and the slides of Canada that can be ridden by bike, cross-country sky or, as Roberto and Laura, by foot. 100 miles corresponding to 160 kilometers. 90 participants, more than half of withdrawals. 48 Celsius degrees under zero, with peaks of -50 °C. 20 the kilos of pulka, the sleight in which the runners kept the bare minimum. We could have tried to describe what does it mean to participate in the Yucon Artic Ultra and we can only imagine the joy of completing a physical and mental path which lasted more than one year, training and race included. We could have tried, but I think it is better to be told about it by Roberto and Laura, by those who personally experienced the feelings and emotions that such a challenge can give. In this tale, the Extreme Crew’s athletes give an important review by which they give confirmation of the reliability of the solar panel and of Tregoo power stations and highlight the technical features that caused them some issues. Their indications are fundamental, since they will help the R&D dep to improve the Tregoo products. Someone think we are mad, someone believe we are heroes. We are neither of them. We tried to pursue a dream and we managed to do that, aware of what we wanted to accomplish.We were aware of our limits, we very rationally knew where we could arrive. We allow ourselves the luxury to love nature, with its amazing beauty, its troubles, its sensations, its cycles and its hard and fast laws. The wild environment and the cold of Yukon are stronger than us and they could have "swept us away" in the blink of an eye. We knew the importance of respect. [...] We’ll keep the unforgettable memory of the nights spent in the woods of Yukon, of the stars that we could not see, since our eyelids were frozen by the grip of frost, of the absolute silence broken only by the noise of the snow under our feet. Very strong feelings. Anyway we are not always able to admit that behind the goals we achieve, there is the support and the participation of many people and that is why we cannot forget those who supported us both in moral and economical terms, providing us with the technical equipment for this adventure. And it is also thanks to them if we have achieved a significant competitive score. We won in the "100 miles Team" category and in the “100 miles Women” category and above all we have been among the only 35 participants (over about 90 people who started) to complete the race, since the extreme temperatures of the second coldest edition caused many people to freeze both at the checkpoint s and in the course of the path. Tregoo (represented by Mr. Luca Martino), who gave us his technological support by providing us with the Power Station Tregoo 10-50 portable solar kit and two Power Packs Lizard 50, fundamental to recharge the batteries of our GPS and of the frontal batteries. We sorely tried both the solar panel and the power banks which have been exposed for long hours to very extreme temperatures (-48 degrees). Faced with such temperatures, the standard batteries provided with the different electronic devices, such as GPS, frontal battery, camera and video camera, had only few minutes of “autonomy” , and therefore it was impossible to think of facing such an adventure under these conditions. The GPS censure us that we were following the correct direction and made us able to report our location on the map. The frontal batteries, due to the few hours of light during the arctic day, allowed us to safely walk during at night. The extreme temperatures have not had the slightest impact on the stock of our Lizard 50 Power Packs. We encountered only to minor issues under such extreme conditions, that faced us with some difficulties. The first one is related to the location of the USB port on the solar panel. In fact, it is very difficult to enter the cable with the device to be recharged wearing some gloves. It is necessary to remove one’s gloves, but the time before your hands begin to freeze is only 15"/20". The second problem was caused by the aluminum case of the power banks: if you handle the aluminum device at such temperatures you risk to have a burn caused by cold. 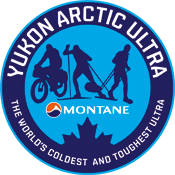 Towards the Yukon Artic Ultra 2017! Before the departure from Whitehorse to come back home, we spoke about when we would have came back, with our minds towards the 2017 edition, for an even more enduring challenge, the 300 miles race. It will be an opportunity to challenge ourselves again, to improve and to grow… but we are aware that the emotions must be shared and that every path offers us the opportunity for a constructive confrontation with others. That is why we would like to relate our participation in the Yucon Artic Ultra 2017 to a project of funds raising, to help other people or animals to make a little dream come true.